If this was water with oil in it, fine but does anyone know if it might be anything else? I have heard of wood being treated with a tar and hemp mixture but I don't know what the treatment looks like. I was also very happy to see how clean at least some of the wood was under there. The black is staining from water and water-oil mixture. The bilge has probably been water soaked for many, many years. It is a possible sign of decay. Let it all dry up and start poking around. If the wood is soft, it is an indication of decay. Poke in the black wood and poke in the unstained wood and compare the "feel". The good sound wood will definitely "feel" different from the decayed wood. I have dried out all the moisture and have cleaned the plywood. since we had the snowiest, coldest winters here in almost 40 years, I'm glad I got the plywood cleaned before it got cold. I just recently got to look at the plywood where it was black. 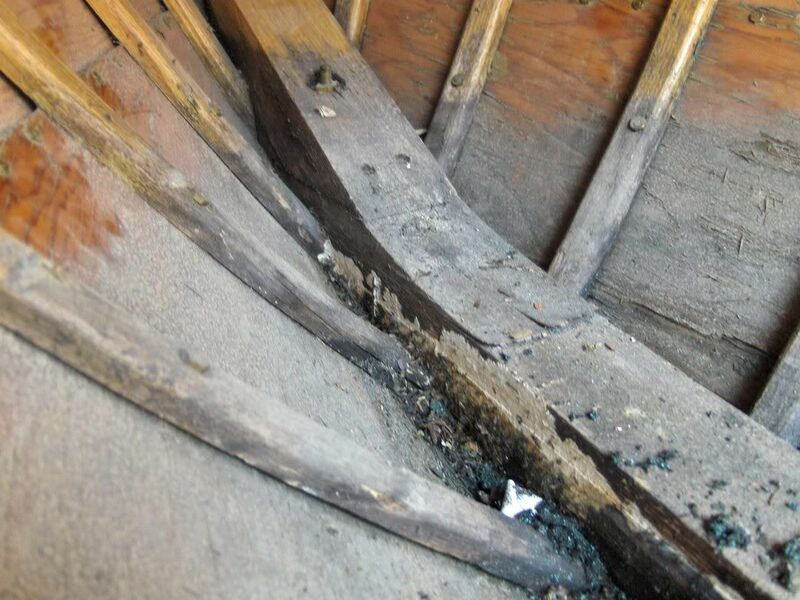 The plywood and ribs are quite solid with no rot visible, once cleaned, the ribs still carry a sheen of varnish. In my research I have found Thompson of New York in 1961 soaked the plywood in a product called "Woodlife", a still available preservative. Woodlife was also used back then as a pesticide to prevent bugs and micros from eating the wood. Research says it was good for about 30 years. (whatever) The new version probably has quite a different formula without the pentachlorophenol. Another thing I learned from the Thompson brochure is that the plywood laps were glued together with resorcinol glue. Some of the ooze is still visible in certain spots on my Sea Lancer. I had planned to roll the boat over and remove the outside paint, remove the keel, clean everything under the keel and re-install it with a Boatlife product. I wonder if I will be able to remove the keel if it was glued with down resorcinol? I tried to remove the splash boards from the side (after removing the screws of course) and they were glued fast. I didn't pull too hard cause I didn't want to break anything (I don't know if someone in the past used any other glue either) Does anyone know if there is a way to separate a resorcinol joint? I am continuing to clean the interior and check the condition of the wood. I have been using one of my favorite cleaners, Spray Nine which dissolves a lot of grease and blackness. Then I rinse with water and dry with a towel and then a fan. The only thing I notice is the white marks in the varnish in some spots. Last edited by LancerJohn14 on Sat Dec 12, 2015 8:27 am, edited 1 time in total. I know of no product that will dissolve resorcinol glue. The only way is to break the joint, which generally ends up splitting the wood not the glue joint, or cutting the joint line with a saw of some type. 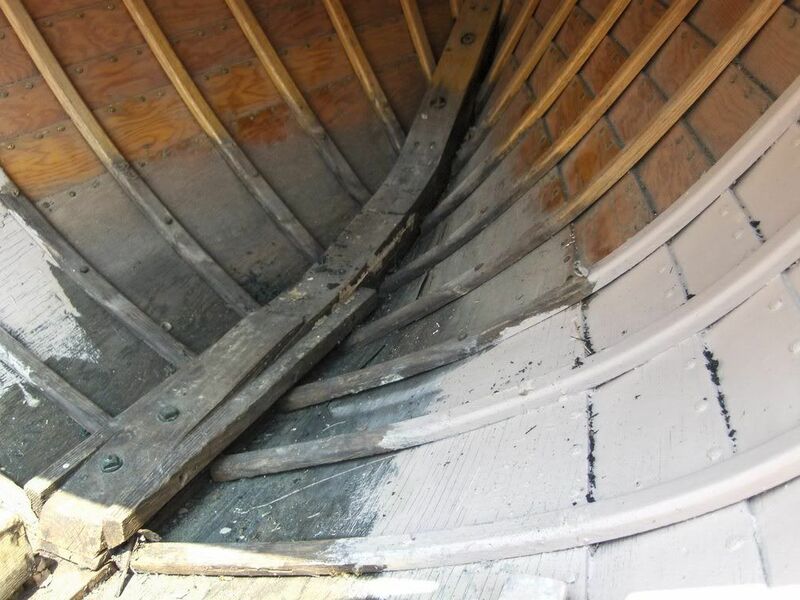 I would not think the keel would have been glued down from the factory, it would generally be sealed with some type of caulking. But who knows if someone else did glue it down at a later date. Thanks to everyone for the input. This forum is a great place to look for answers from experienced people for us who have never done this before. I really appreciate your help. I have taken my time in doing research and trying to learn the proper way to do things. 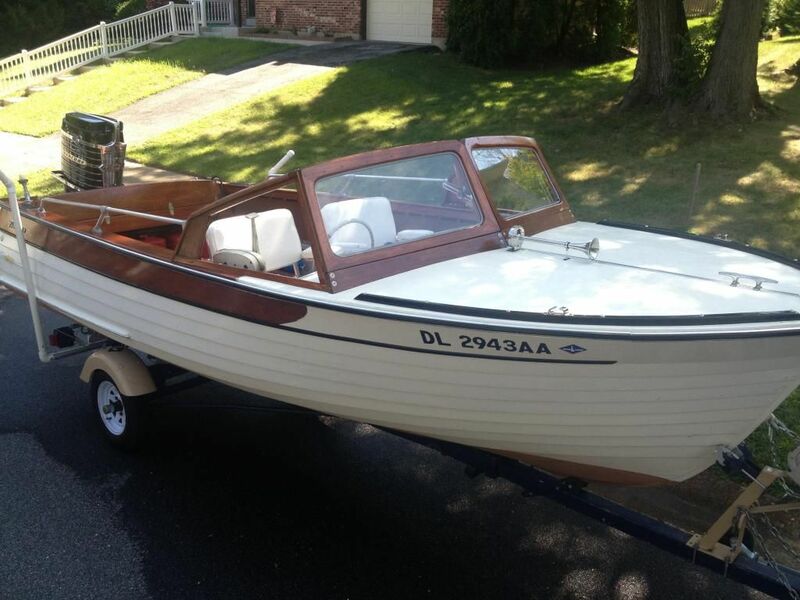 Still have more questions since early 60's Cortland boats are just that different. After washing the black off the inside bow area it was time to check the wood and evaluate. The plywood was solid, the keelson is solid, meaning no soft wood at the end of the screwdriver. The ribs under the keelson are also solid. The ribs along the inside stem are not only rotted at their ends but some are also broken off at the inside stem. (is that the proper name)? If anyone knows, can anyone tell me if the small pieces of wood (I don't know what the are called) that are screwed to the sides of the inside stem were original to Cortland construction or an add on/repair? It looks like the original frame or rib ends at the stem were nailed into this board prior to garboard plank installation, I tried to remove the screws and found the mystery boards are resorcinol glued to the stem as well so I put the screws back in and left them be. They are angled on the bottom and the ribs don't really fill the space between this board and the garboard plank. I believe since the ribs were nailed and glued into this board (if the are original to the boat) so the new rib ends I plan to scarf on should be tight to the board as well. Once you get past the stain area the oak ribs are like new up the sides. As for the keel cap - I recently removed mine. It did not appear to be attached with the same glue that they applied to the planks and garboard panels, but there was some sort of sealant/caulk there. Follows is how I removed mine. This process will be quick or slow, depending on how much glue was used, whether or not the KC had been off before, etc. First remove the paint off the top of the Keel Cap (KC) so as to locate the bolts and screw holes. I used a sharp paint scraper and a random orbit sander (hooked to a vacuum to collect the dust). Be thorough on this step. Though the bolt and main screws are easy to see, there may be random nails placed by the original builder or a past owner (mine had one or two). Remove the material filling the bolt/screw holes. Remove all the caulk along the edges of the KC. The paint scraper is a great tool for this as well. After removing the bolts, screws, nails, caulk, I started at the stern end and used a spackling tool to get between the KC and the garboards. Then tapped a chisel and or wooden shim in that spot. You just want to get it in far enough to apply a firm parting pressure. Leave that shim or chisel there, move down a bit, repeat, move down a bit, repeat. After you have two or three in, go back to the first one and tap that in further for more parting pressure, then the next, and on down the line. If you get to a spot and cant get the spackling knife in, or the cap does not want to release, be sure that there is not a nail or screw there that was missed. If there isn't, but it still won't release, move down a bit past that point and continue on. Be patient if you encounter this. I wasn't and I used a chisel and pried at it and though it parted, I had actually ripped way the first ply (layer) of the plywood. Resist the temptation to get one end lose then muscle it the rest of the way by pulling down or driving a tool or wedge along. You don't want to risk cracking that 55 year old wood. Regarding the bolts. On my Thompson they go in through the KC, inner lower keel, inner upper keel. The nut is on the inside. To remove the bolts i backed the nut out until it was flush with the top of the bolt and rapped it with a hammer to break the bolt free (If you take the bolt all the way off and hit the bolt it with a hammer, you will damage the threads). Then took the nut off, and used a long carriage bolt of a smaller diameter to drive the bolt out. Peter, does your Cortland have a plastic seam cover like this one? Can't figure what to do with that when the time comes. mine does not have that piece. The best picture I could find is below, showing a metal strip of some kind that runs down the center. Though I am suspect there was some sort of trim, I don't believe that what is there now is original. The white vinyl bow covering was the original feature for the "Custom" Sea Lancer, but again I don't think what is there now is the original material. The Thompson Catalogs you mentioned are available thru this website: http://www.wcha.org. They have the Thompson catalog DVD & Thumb drives as well as other boat and canoe manufactures catalog DVDs available. Hey Peter she's a beauty. Side rails and everything! I got this cool wooden thumb drive for Christmas last year with all the Thomson catalogs on it. Excellent source of information and photos. I like to see what others have done also. The Internet has many vintage ads that are helpful too. If you google 1961 boat horn or whatever you can find a lot of old 1961 Boating or Motor Boating magazines on google books. These have great boat ads for lights, horns, and boats of the era. Fun to look at. Is that a tower of power I see on the back? I have one of those also. I find it very hard to take my time and do things a certain way, waiting for the right time to do this or the right parts to do that. I'm looking forward (I can't wait) to putting her back together and trying her out. The fellow I bought her from said she has always been stored inside and hasn't been wet since 2002! You have a beautiful boat there. Hope to meet her in person some day. Indeed that is a Tower O' Power. 1963 6cyc 100HP. I've modified it a tad (shocking I know) by replacing the original manual tilt assembly with a '80's era power tilt/trim, and as well a custom electronic ignition fabricated from a Pertonix points conversion kit for a six cylinder automotive engine. Both mod's can be completely reversed to the original config. There is a long series of posts on both mod's at Fiberglassics.com, forums/mercury outpost . Also took it all apart and repainted it with the exception of the engine wrap, which is a project for this winter if time allows. Those side rails are cool looking, but truthfully, always in the way. I need to redo the mounting points on the gunwales as the screw holes are striped so they are lose and can't be tightened. I'll figure a way to mount them such that they can easily be taken off an on without worry about the mounting points. That's for another day. I'm off to search the interweb for pictures! Here's photos of the fall work so far. I got the rib anchor board off the starboard side. The board was shrunk and rotted. So I made new ones. The ribs were nailed and glued to this board at the inside stem. I think I might bolt the new rib ends to the new boards without having to remove the garboards, which I don't want to do. I began cutting the ribs for the new rib ends. I removed the bow "eye" which I think was not used as the previous owner told me they never had a trailer. It cost 84 cents. The deck has a peeling thin coat of varnish over what looks like the original finish. The new varnish protected the original finish pretty well from what I can see, although it may not show in the photo. More photos to come as I my get to cut some more ribs over the winter. Today believe it or not it was 58 degrees. Sunday is supposed to be 65. First photo after having removed the floors for the first time. Its made of red oak I used to practice cutting with. The table saw worked for the new pieces. The angle grinder was too hard to control in such a small area. I practiced with the multi tool and could cut along the grain from top to bottom, that way if the blade goes deep, it goes deep in the right direction. Once I learned how that worked, then I set the guide alongside the rib where I wanted the scarf cut and transferred the lines at each inch to the boat rib. Then I drew a line on the side of the rib using the piece of wood as a guide. I cut with the M12 saw blade on the top inch lines down to the line on the side. then from the top down, along the top of the rib from cut to cut (like you would with a chisel). Then changed heads and sanded down the bumps. Then back to the saw attachment to lightly smooth. Then the sander again. The saw blade is fine so the patience is required not to push it too hard into the wood. When I find I'm pushing it I have to stop and walk away. This one rib has taken me 2 weeks, ten or so minutes at a time. Good thing I don't have to have it done by a certain time like for a customer, I'd be out of business on the first one. Here's a photo of the boat when I brought it home that shows the 110 HP Kiekhaefer 2-stroke.